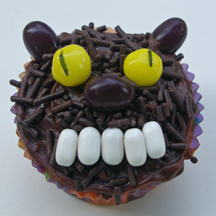 The trick to these Halloween werewolf cupcakes is to make sure the frosting looks nice and “furry” by pulling upward with your knife or spatula several times to form peaks. 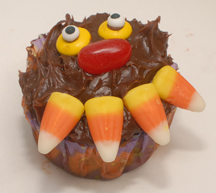 What You Need: 1 cupcake (baked and cooled); chocolate frosting; 4 candy corn pieces; 1 red jellybean; 2 yellow M&Ms; candy eyes (or use candy dots or just a dab of black writing icing). Make That Cupcake! : Frost cupcake generously, and pull upward with knife or spatula to form fur-like peaks. Add 4 candy corns for teeth, a red jellybean nose, 2 upside-down yellow M&Ms for eyes and then use a tiny dab of icing to attach a candy eye or candy dots (the kind that come on a strip of paper) or just a little dot of writing icing. It’s howling good fun!